Last year we introduced the highly successful JOOLA Energy rubber to the world. Today, we uncover JOOLA’s newest Energy Rubber. 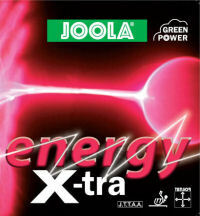 Introducing JOOLA Energy X-tra! The 37.5° soft sponge with the built in speed glue effect provides for even more spin and speed. It is especially suited for players who put emphasis on stroke control without the need of speed glue. Green Power is a rubber technology, where performance achieved from fresh gluing is already incorporated into the rubber. Bounce, feeling and the sound of fresh gluing are noticeable features of this new product. Feel the speed gluing effect minus the speed glue! I got 2 sheets of this on Tuesday and glued it to my Kool blade with X-glue. I’d have to say that Xglue works pretty good if you want to nail down some curled up rubbers for sure. My first impressions of the rubber is that the sound when hitting is exactly like a glued up sheet of rubber. Very loud indeed. Speed was pretty good, but still not as fast as my glued up skyline3. Spin also felt lacking (is it my swing?). I tried to serve short and spinny and it seemed like it didn’t have as much bite as when i used my Chinese rubber. I had the same issue when trying to loop. I’m still getting used to it so i might get better with my loops and serves over time with this. Serving short was also a bit tough, i guess because of the speed of the rubber. Will tell you more once i get used to this rubber =). So I got to play at the JCC for about 2 hours with the black side on my forehand. I can say that there was no noticeable difference between the two. the black side had just as loud of a sound as the red side. am i just lucky that i didn’t get a dud? who knows. but my loops and backhand have no gotten better or used to the rubber. so i guess that’s a plus. i was able to put a lot of weight and spin on my sidespin loops so the rubber is pretty spinny. If i put a lot of effort into my shots then the ball will go faster than my Skyline3. I guess the reason why i found it a bit slower than my skyline 3 was because i was still getting used to the control. When it comes to touch shots, the rubber tends to be a bit bouncy but if you have a good feel, then there is no problem returning the ball short. so far i’m able to do double bounce serves onto the edge of the table, but we’ll see if i can get it shorter with just as much spin.